With less than two weeks to go now its time to let everyone know the final line up for our DEFine Modellers Day on 20th January. 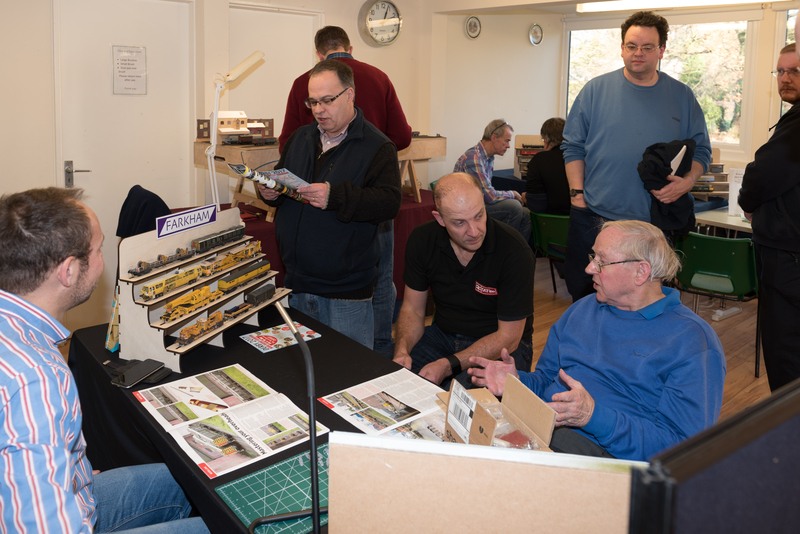 As before, this is not intended to be a traditional exhibition, more of a forum for modellers of all capabilities to meet and discuss projects and maybe pick up or share a tip or two, whilst at the same time see some excellent layouts and examples of modelling. 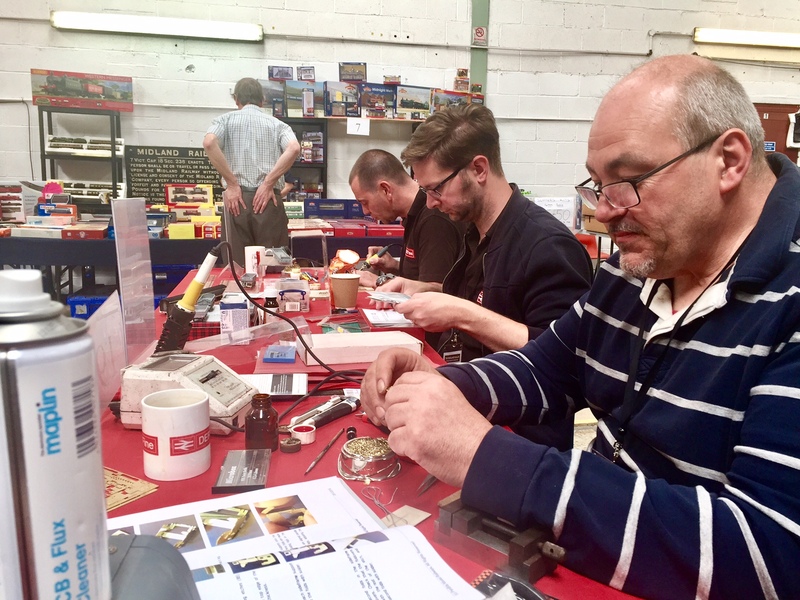 We are indebted to the layout owners and demonstrators who have volunteered to come along to make our day a success. There will be no traders present other than a few small traders who are providing demonstrations of their products. “Down Sidings” – Richard Coleman. This excellent OO layout depicts an engineers yard, circa 1990, taken over by Signal Engineers. “Enigma Engineering” by Paul Gittins. Paul is keen to have people engage with his layout and have a go at shunting if they wish. “Underhill Road”. Dave Roome will be debuting his almost finished latest layout and rolling stock he has been working on. “Field Lane” by Ashley Toone. Ashley attended last years event as a visitor and is happy to return this year with his layout. NAG Test Track. 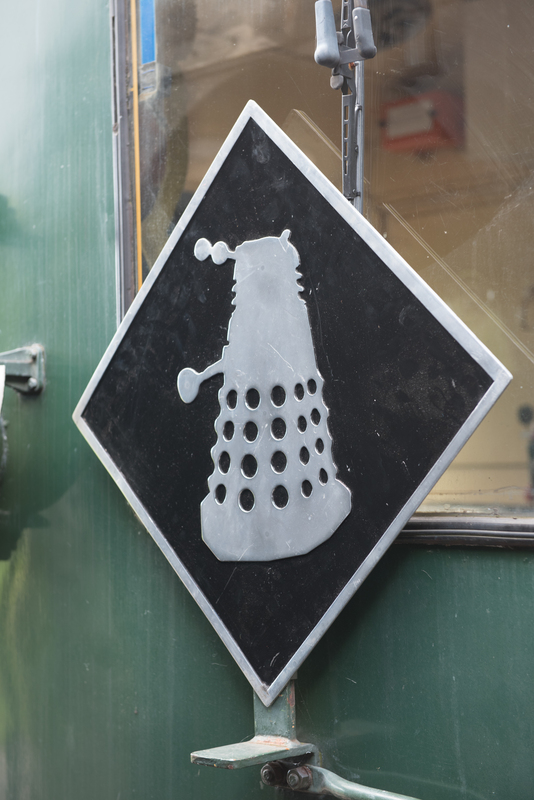 The Nottinghamshire Area Group of the Scalefour Society will be in attendance with their test track. The track work incorporates the major 4mm gauges of OO, EM and P4. The NAG group will also be happy to discuss S4 Society membership and what NAG get up to. “Splot” by Paul Spencer. Last year Paul brought along one of the boards from this WIP layout and this year he will be bringing the other board to tempt us as to what it will finally look like. Track Building – Howard Bolton. One of the best track builders in the hobby, Howard will be available to discuss and instruct you on building track. Wagons in P4 – Tom Silsbury. 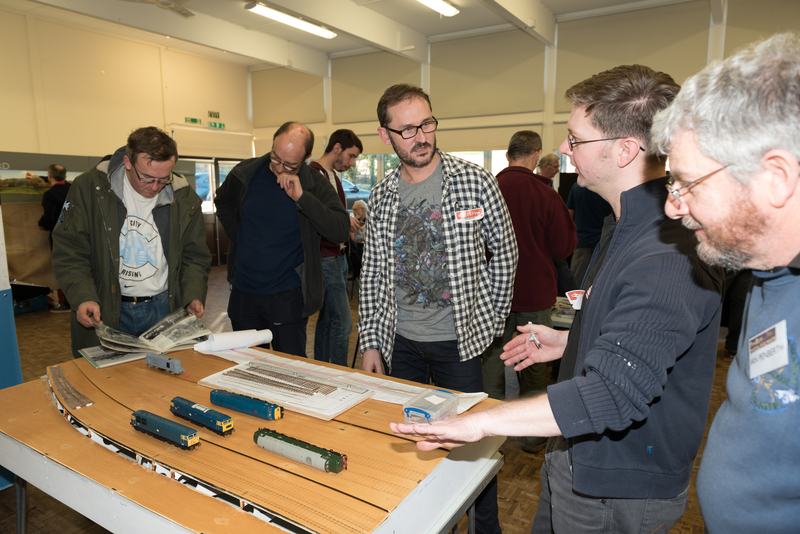 Tom will have a selection of wagons to display and explain his conversion to P4 methods. Penbits Bogie Assembly – Ian Penberth. Ian will be demonstrating the construction of the sprung bogies he has designed for many D&E locos, and will have a selection available for sale. Buildings and Landscapes – David Wright. A well known and acclaimed modeller of buildings and landscape work, David will be available to demonstrate his techniques and help with any questions you have to help your projects get moving. Wagon Kit Building – Robert “Bertie” Austin. Robert has built up a lot of experience in building Rumney Models chassis kits and will be sharing his work and methods on the day. “DCC Wiring” – Phil Eames will be bringing along one of the boards from his excellent “Calcutta Sidings 2” but will be showing off the underside and available to discuss how he wired it all up for DCC. Thats it, small but perfectly formed. We hope you can join us on the day for a cuppa and a chat with like minded friends on our great hobby. Some images from last years event. Colin leads the discussion at Alex’s OMWB demo with “Farkham” stock on show. In addition to the line up previously published in the previous post on our blog, we are pleased to announce the addition of some more items to the line up for our Modellers Day on 20th January 2018. We are pleased with the new additions to our line up and hope you can come along on the day. Following on from the success and great comments we received after last years event, we have decided to do it all again in 2018. The date for the event is the 20th January and will once again be held in Risley Village Hall. The event will run from 10am until 4pm. The venue is easy to find, its just off J25 of the M1 (DE72 3SY). So what have we in store for next January’s event? 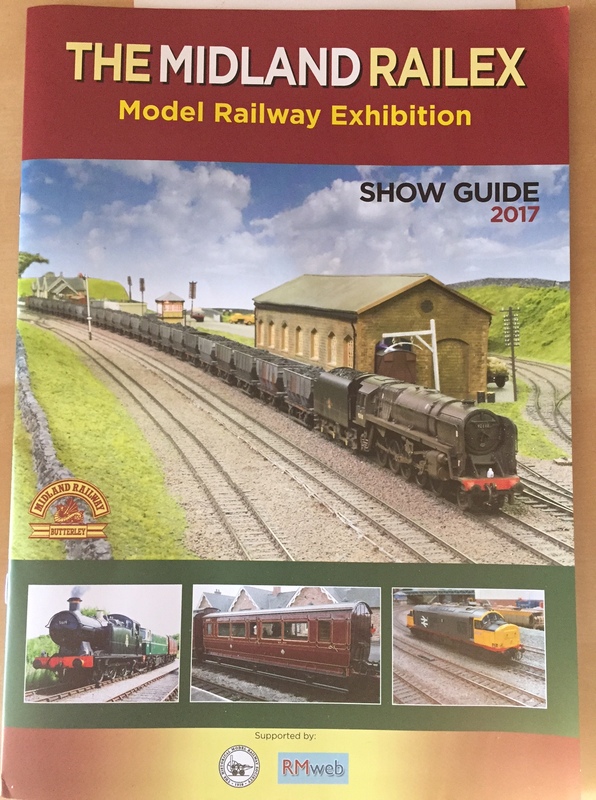 Those who attended last year will know that this is not sold as a typical Model Railway Show, we call it a Modellers Day. The intention is to bring together railway modellers of all competencies to talk, learn and share experiences with others. There will still be a few layouts to look at though but we wont have any trader stands. There will be some small traders there doing demos and they may bring along some of the products they are demonstrating for sale. It is also a good opportunity to pick up any orders you have placed with them. Extreme Etchings Clinic – Brian Hanson. Anyone with any questions on putting together Shawplan/EE etchings, glazing etc have the opportunity to have a chat with Brian and get some pointers on etching construction. This is what we have so far, it may be changed slightly if problems arise etc, but we will endeavour to keep people updated via our blog. Entry fee is being held at a modest £3 per person and refreshments will be available all day. The hall has its own parking but on-street parking is no problem if it overflows. If you want to see how last years event went look for it further down the blog. We hope you can join us. 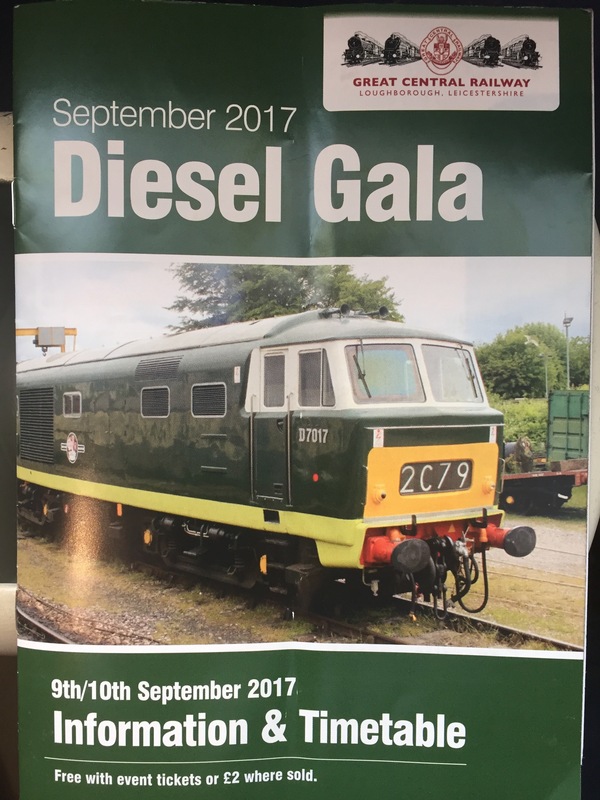 Having missed the 2016 Diesel Gala at the Great Central Railway due to forgetting all about it, we were back on track this year. First on the platform at Loughborough were Bertie and Pete. Bertie had kindly offered to give Pete a lift to the event this year, so we left in plenty time to enable us to get the 9.45 Griddle car service. No sooner had Bertie hit the platform he was up to his “Cabinit” antics with D5343. Pete and Bertie quickly proceeded to the Griddle car and did a land grab on a few seats for the guys arriving to catch this train. We were quickly joined by “Bachmann Steve” and Brian and his mate. 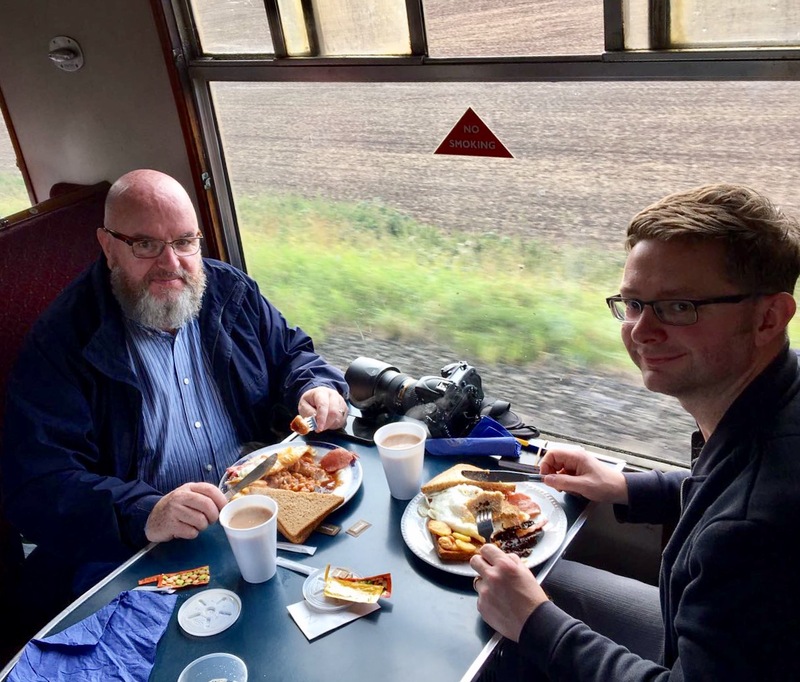 Once assembled we duly proceeded to order up the infamous GCR Diesel Gala all day breakfast. This is a superb feast and highly recommended. With food delivered the train was off for the first run off the day to Leicester North. On the way back down the line to Loughborough we alighted at Quorn to let Bertie get under some wagons and meet up with 37714 “Cardiff Canton” resplendent in its new triple grey livery. After a few runs up and down the line behind various traction, by which time we had lost “Bachmann Steve” it was time to visit the sheds and the bridge. It was noticeable this year they had done a bit of a tidy up in the yards hopefully in preparation for exciting new developments at the site involving the “Bridging the Gap” project. We stood at the gates and viewed progress in the distance of the twin girders installed last week preparing the way for the GCR line to pass over the Midland Main Line. Once back up at the station Bill had now arrived to join us ( and scoffed and all day breakfast) and we partook of some fine ale namely the Nottingham Sooty Porter which was very nice. After a few more train runs it was time for Brian and his mate to depart for another engagement. Apparently they were giving up a day on diesels to go on a photo shoot with some big kettle things up at Butterley. As Bill had not seen the bridge installation Pete, Bertie and Bill made a return visit to the bridge. Time was now getting on and soon it was time for an evening meal. 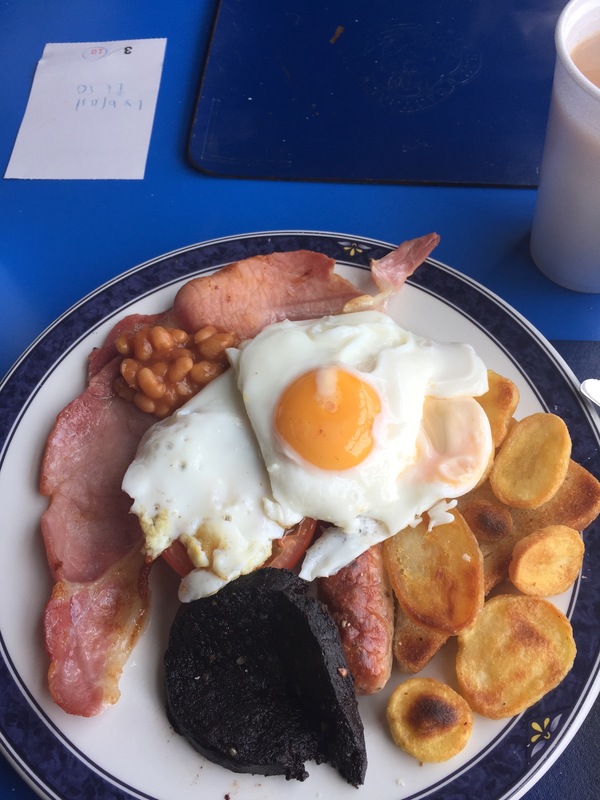 The options for the late run Griddle Car meals didn’t look too appetising so Pete and Bertie decided it just had to be another all day breakfast. We had agreed to stay for the next run as it was 37714 but just before it was due to meet up with its coaches it turned in a sick note. Luckily there was an able deputy in Class 20 D8098. We may have been denied the class 37 but at least our last run would be on English Electric traction. We secured a seat just behind the engine and opened the widows full, and so with full thrash the 20 pulled us away to Leicester North and then a non-stop run back down to Loughborough. A great day was had by all. The weather was kind to us and we were well fed and watered. 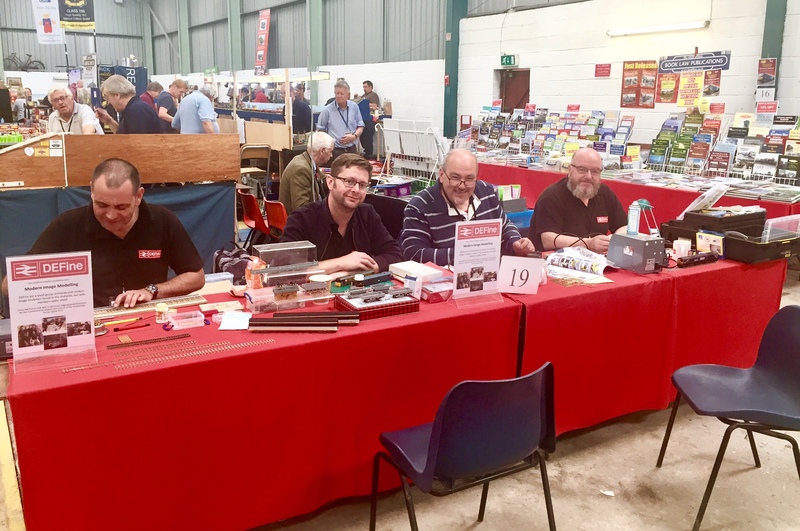 Once again, as in previous years, DEFine agreed to provide a modelling demonstration at the Midland Railex held at the Midland Railway Centre. We were based in the diesel shed as usual which is probably the busiest (and dustiest) part of the Midland Railway complex. The show lasted two days and allowed people to engage with us on our projects and for us to try and help them with any issues they are having with their own projects. This year we had Pete, Bill, Brian and Bertie doing the honours over the weekend. As Brian had opted not to bring his trade stand this year, this gave him the opportunity to get back to demoing along with the rest of us. This year we had Bill building the final pieces of P4 track work for Glasgow Queen St., Bertie was fully engaged on his wizardry with wagons and doing some great stuff as usual. Pete and Brian were both busy building Penbits suspension units for a Class 37 and Class 40 respectively. On the Saturday evening we were treated to a nice run on the train being hauled by class 33 and 47 traction. On one of the stops at Butterley we alighted and took possession of the fish and chips ordered. Its lovely sitting at the table in a Mk1 coach eating our suppers on a nice sunny evening. After a few more runs up and down the line it was time for home. We hope we did our bit over the weekend, we enjoyed it, but hopefully the benefiting charities did well out of it too. Bertie in full “Cabinit” mode waiting in anticipation. Today we said farewell to our dear friend Chris Messer. As many of you know Chris has been battling cancer for a few years now and all through this time he has faced his challenge with dignity, selflessness and humour. His strength has been an inspiration to us all and we are thankful for the time we had with Chris albeit too short. 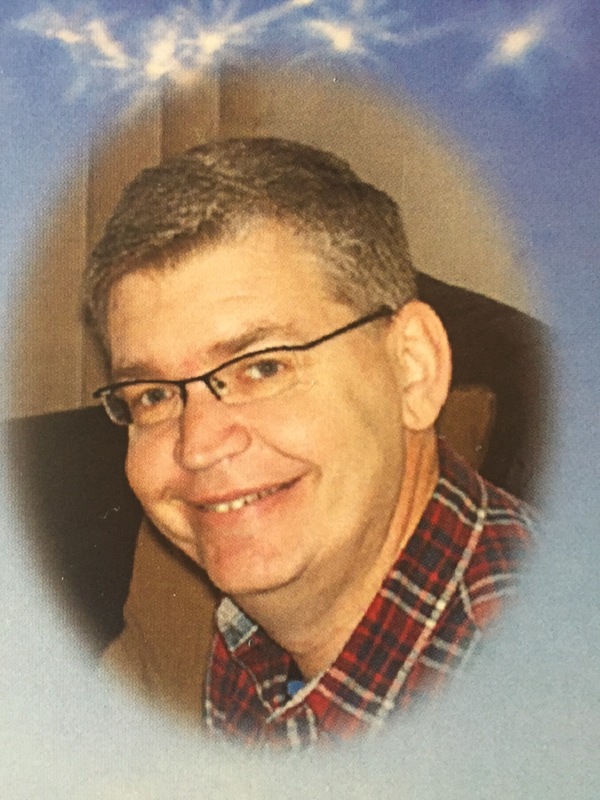 Chris was a true railway man and worked in the industry for many years. This spilled over into his private life and he was keen on railway research mainly in support of our mutual hobby, building model railways. 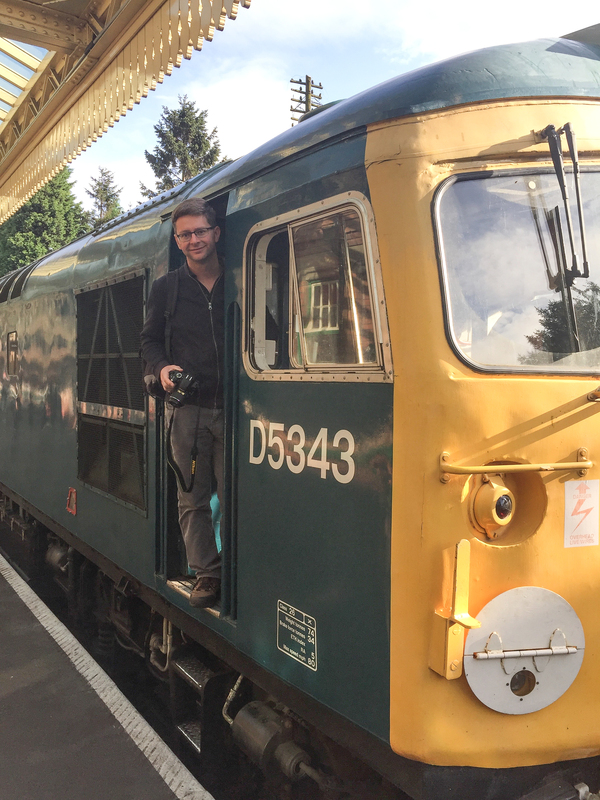 As well as having a deep knowledge of Britain’s railways over the years Chris was a keen modeller of the American scene and had built up many friends on the internet and social media. 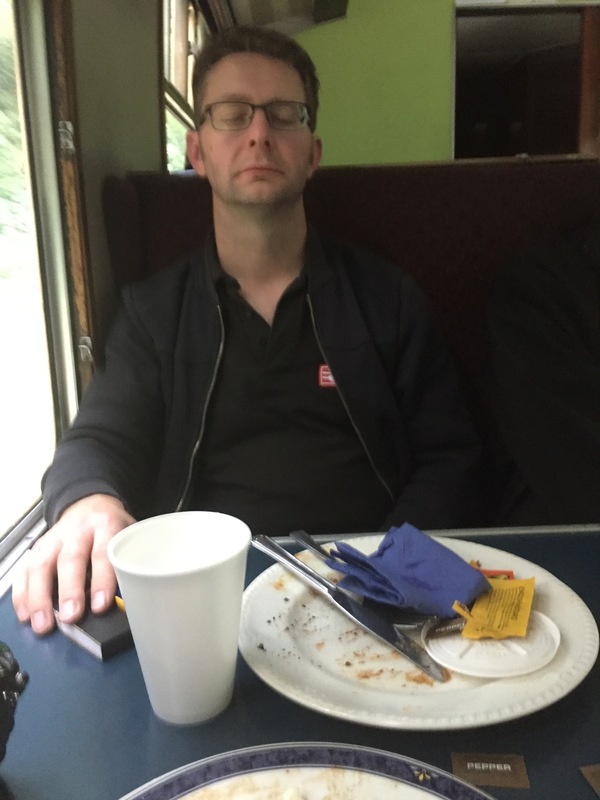 Chris was always keen to share his knowledge on the subject and engage with anyone who wanted to talk trains. Chris was in his time a member of the Mickleover Model Railway Club (where is where I first met him in 1997), and has over time been an active member of Diesel and Electric Modellers United (DEMU) and RMWeb. 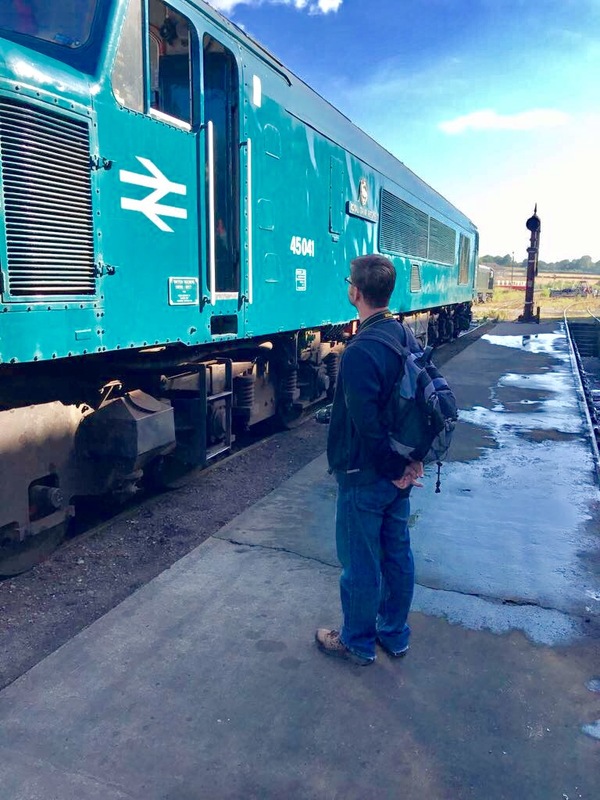 As a member of the local area group of DEMU we would go out with friends and do demos and visit exhibitions. In September 2010 Chris was one of the founder members of DEFine Modellers but unfortunately around that time his illness was beginning to demand more of his time for treatment and regular visits to hospital in London. 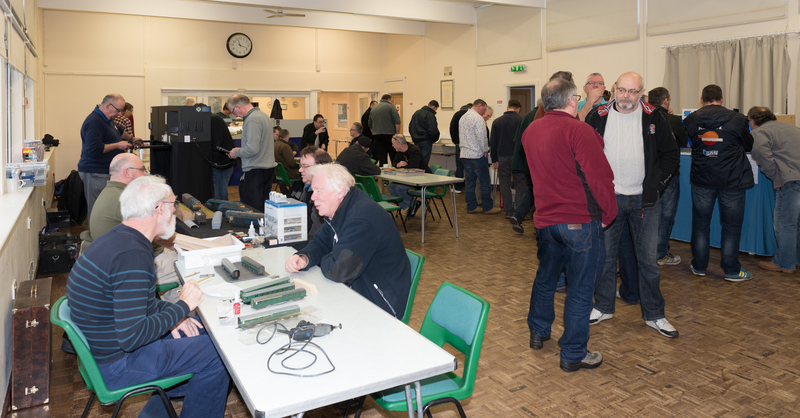 We continued to keep in touch with Chris and it was great to see him attend the DEFine Modellers Day back in January. I think he enjoyed it too. At his send off today, the congregation included a good number of his ex-work colleges and friends from the model railway community. Although sad, it was far from sombre with music from the likes of Queen, The Cure, The Housemartins and ELO being played. I am sure the person in charge of the music made sure “Mr Blue Sky” was turned up a few notches, it was great and very fitting on such a beautiful day. His family did an incredible job in supporting Chris through this long illness and knowing Chris he would be feeling more sorry for their inconvenience than his own situation. They did an outstanding job and his wife Ellie, children Daniel and Hannah and son in law Steven should be very proud. 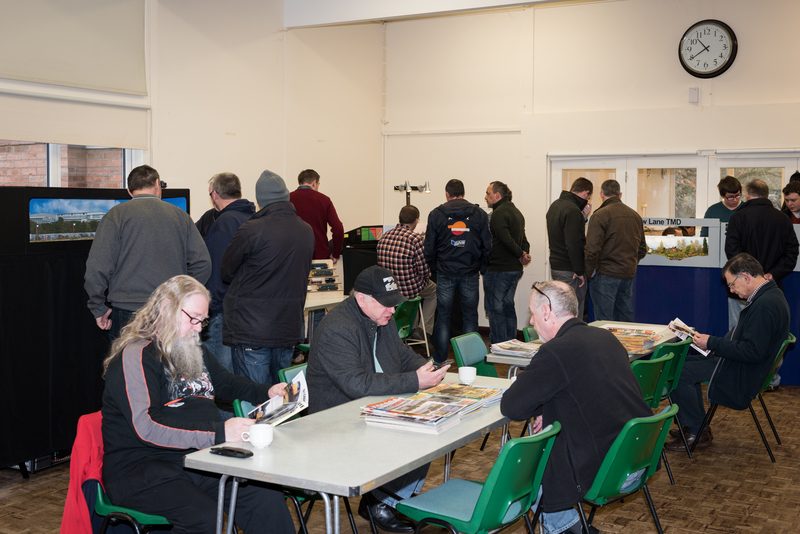 Well that’s another DEMU Showcase out of the way for another year, but it was a great event. 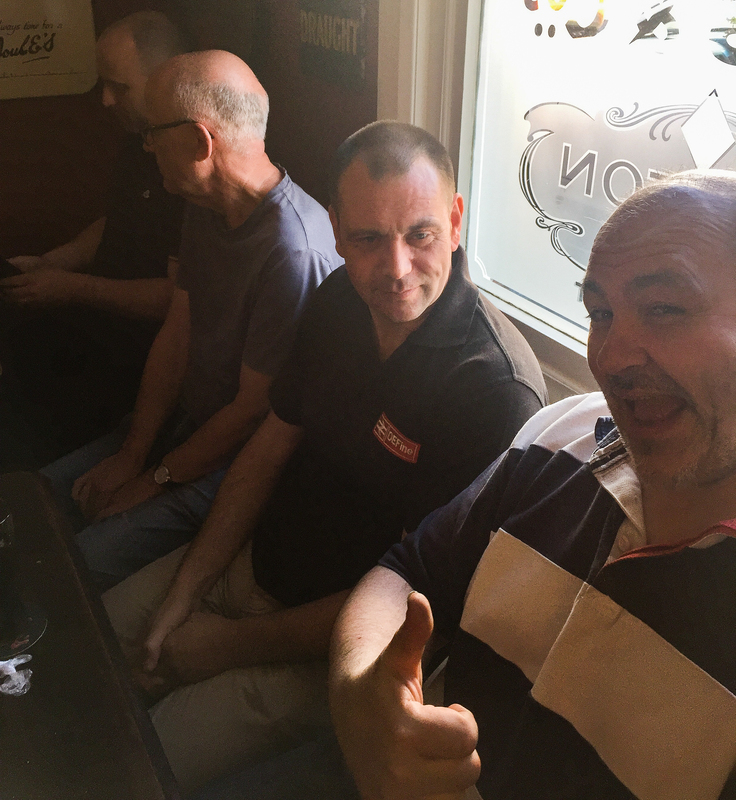 The great thing about DEMU Showcase is that it brings together many of us who see each other fleetingly at shows throughout the year and shoves us into a hall, pubs and curry houses for two days! The social side is as important as watching and debating great layouts and demos in pleasant surroundings. So on Saturday Bill and Pete met up with Brian and the van at around 7.15am at McD’s in Burton for breakfast before heading out to the venue. We were at the hall sharpish for opening time and swiftly started to erect the Shawplan stand. Following a session of hanging all the stocked up items on hooks we took the chance to have a wander around the halls and see some of the show before the doors opened at 10am. It was obvious from what we saw that the punters in the queue, (which was by now snaking way around the hall and adjoining street), were not going to be disappointed. Saturday was very busy and it was great to see so many familiar faces and chat with so many people on the stand. Some of them even bought stuff too! Soon the day had flown by and 5pm was drawing near. On the announcement that the show was now closed for the day, the DEFine group and friends started to assemble for our trip to the Coopers Tavern. 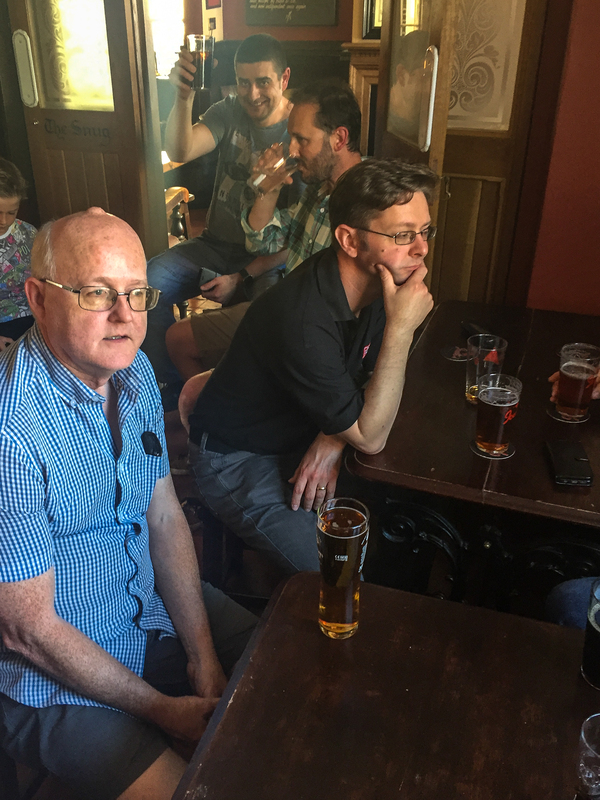 Having got there and got the beers in , 1872 Porter from Elland Brewery at 6.5% was your editors tipple of choice, we took over the snug and generally had a good laugh. Drivers were mainly on soft drinks and the “women” in the group had cider. The usual suspects were there with the notable omission this year of Jim Smith-Wright and Colin Craig who had other business to attend to. 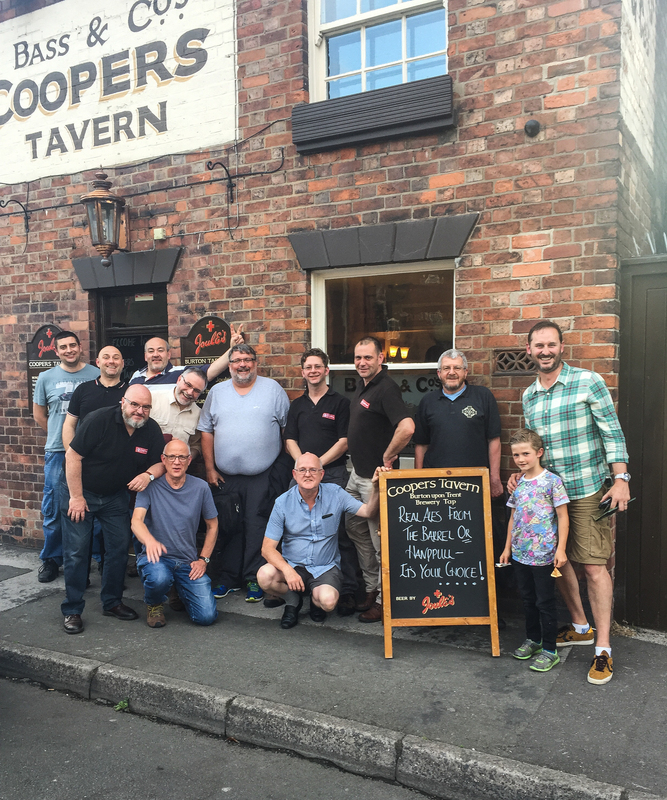 Some other regulars were with us though in the shape of Paul “real men wear shorts” Wade, Tim Horn and others you will see in the photos. Having downed our first beers it soon became time to stock up with beer again and head next door for the curry. Thankfully we had no chilli incidents this year and Wavey Davy survived. The meal was excellent as usual and as always great value. 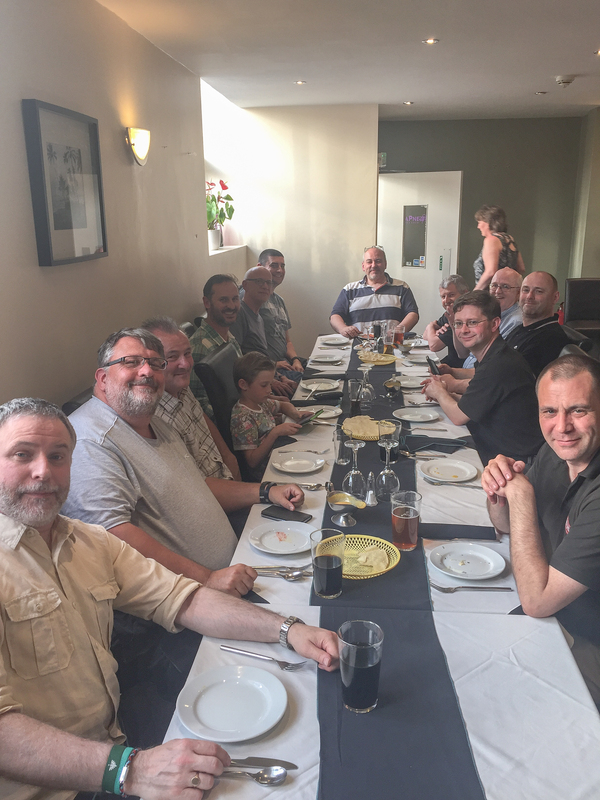 The fourteen attendees agreed it was superb and we passed on our thanks to the staff promising to see them again next year. Having filled up on curry, it was time to make the 25ft journey back next door into the Coopers. Before heading in we stopped outside for a group picture, which was a challenge in itself. 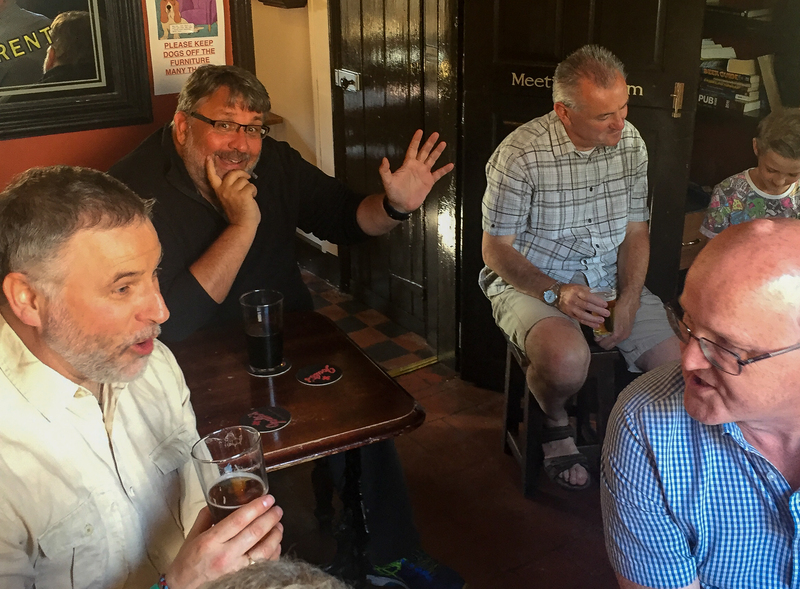 We took over the snug again and picked up on the banter where we left off. By the time some of the other DEMU’ers started to arrive it was time to head home for a few people but I am informed the remaining assembly were kicked out at closing. On the Sunday at the show as you can imagine it was a much slower start, and there were many odours around the halls testifying to a great evening the night before. Stories started to emerge of people climbing walls after the pub, people falling asleep in pubs and one of our friends actually woke up in the wrong hotel! As mentioned Sunday thankfully was more leisurely but still great to have the time to chat and take a wander around. By 4pm it was time to pack up and we had the stand broken down and ready to go in half an hour. 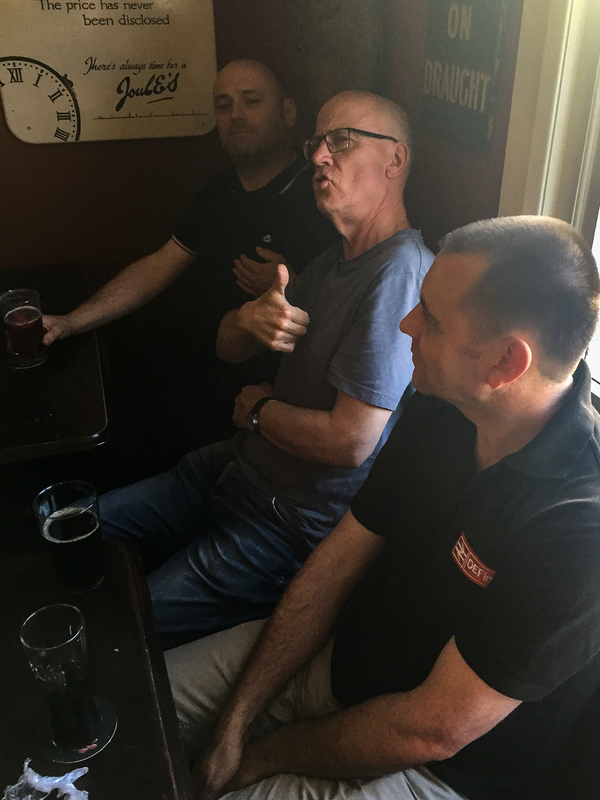 A big shout out to John “Nobby” Norton and his support team for putting on such a great event. Looking forward to next year already! And so it was back to the Coopers to finish the night off. Check the legs on show from the real hard men.